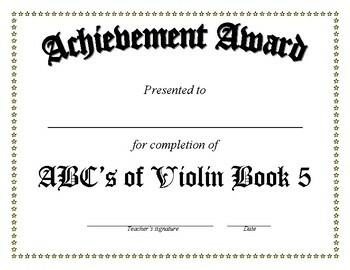 Includes certificates for ABCs of Violin books 1-5. While the books have certificates of completion in the backs, many students prefer to have something they can keep in the front of their lesson binder, hang on their wall, or otherwise display. You are free to make as many copies as you like for YOUR OWN CLASSROOM OR STUDIO. Please do not distribute to other teachers or to people who are not your students. You can buy additional licenses for other teachers at a 10% discount.